This brand new brick and weatherboard home is situated well back from the road, and set alongside Pinehill Reserve. Open plan kitchen dining and living area with top appliances, light wooden flooring, plenty of storage, central vac system, and great outdoor flow to deck and well designed garden. Excellent granny potential set up on the lower level with 2 bedrooms and separate living area. Upstairs offers additional living area, master bedroom with walk in robe, fully tiled ensuite with bath and shower and double vanity. With a further 3 bedrooms (one being downstairs with ensuite) this home offers great flexible living. Beautifully finished bathrooms throughout. Double garage with internal access, additional parking and all within easy access to the motorway. 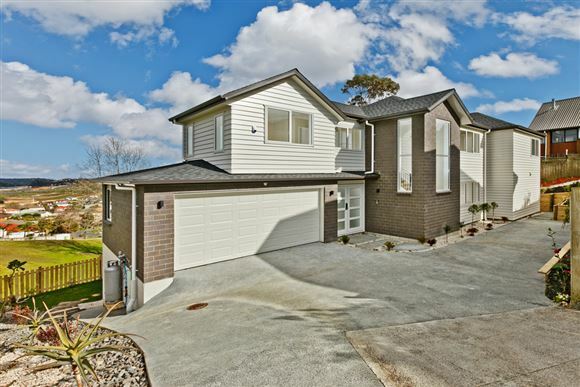 Fenced off, within an easy walk to Pinehill school and zoned for Rangi College making this the ultimate family friendly home.